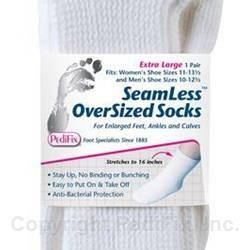 Oversized Socks feature hand-sewn toe seams to eliminate irritating ridges, which is especially beneficial to people with diabetes, arthritis or sensitive feet. Their cross-stretch design conforms to feet without binding or bunching and an anti-bacterial finish protects against germs, plus extra-wide tops stretch comfortably over enlarged feet, ankles and calves, casts and bandages, too. Resilient fibers allow them to return to their original shape after laundering. 1 pair.